Fighting For Our Unions, Democracy and Future in the Age of Trump helps union activists and community members be more effective in fighting forward against the Trump regime, its allies and Corporate America. It is critical that we understand our ancestors faced the “divide and conquer” strategies of Corporate America and its allies. These strategies were based on racism, sexism, anti-immigrant hatred and other forms of bigotry and are being used once again to divide working people and our nation. Learning from our ancestors’ successes and failures is critical in our efforts to fight forward toward a better future for all of us. Click here to view Powerpoint presentation. Making the American Dream Real for Everyone focuses on the rise and fall of unions and our allies over the past 125 years in our fight to share fairly in the wealth we produce and build a more just and equitable country. It provides inspiration and valuable lessons about our successes and failures and what we can learn from our history to help us fight forward toward a better future for all. This is a video of my “Making the American Dream Real For Everyone” that I gave to the Cement Masons Local 528 in Seattle in 2018. A 2013 version at the IBEW can be seen below. [Click here to view the Powerpoint presentation]. Making the American Dream Real for Everyone, in five videos, was presented to the International Brotherhood of Electrical Workers Local 46 organizing blitz in Kent WA on September 25, 2012. The first four are short segments that can be watched and used for discussions. The last video in this set is all four videos combined. 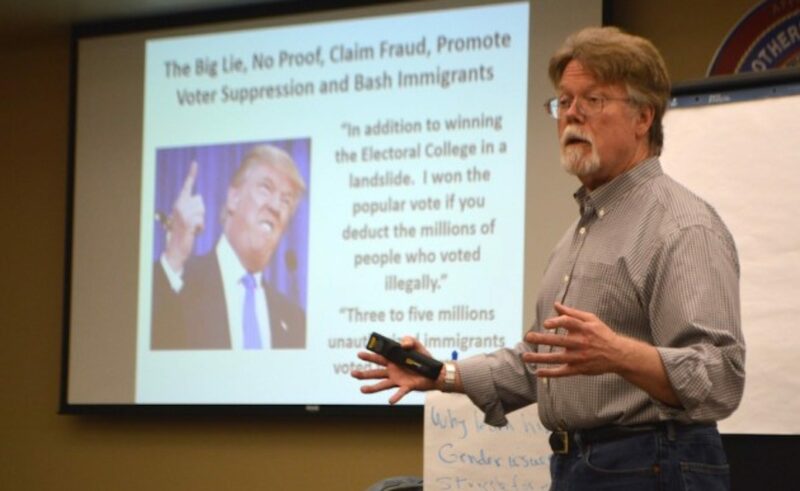 Speaking from the Heart: Making the American Dream Real for Everyone was a 2-day ‘train the trainer’ workshop held at the Washington State Labor Education Research Center in Seattle on February 2-3, 2017. The videos provide hands-on exercises and materials to become more effective at doing presentations and encouraging activism using a combination of history and heart-felt personal stories. Click here for the workshop training handbook. Winning Big in Hard Times explores the rise and fall of unions and our community allies in strengthening our democracy and Corporate America in their right wing allies attacking our democracy over the past 125 years. It concluded with ideas about how we can reclaim our democracy. Which Side of History Are You On? focuses on Corporate America’s counterattack against organized labor and our diverse community over the past 45 years and how disunity between organized labor and our potential community allies and movements weakened us. Most importantly we learn about many examples of major successes that new labor/community alliances are winning and how to rebuild our power. Making Retirement Security Real for Everyone focuses on the nationwide campaign to defend and expand retirement security, Social Security, Medicare and Medicaid.